The Junkers Ju-390 was a long-range derivative of the Ju 290, and was intended to be used as a heavy transport, maritime patrol aircraft, and long-range bomber. It was one of the aircraft (along with the Messerschmitt Me 264 and Focke-Wulf Ta 400) submitted for the abortive Amerika Bomber project. The V1 was constructed and largely assembled at Junkers' plant at Dessau, Germany, and the first test flight took place on 20 October 1943. Its performance was satisfactory enough that the Air Ministry ordered 26 in addition to the two prototypes. However, the contracts for the 26 Ju-390s were cancelled in June 1944 and all work ceased in September of that year. On 26 November 1943, the Ju 390V1 - with many other new aircraft and prototypes - was shown to Adolf Hitler at Insterburg, East Prussia. According to former Junkers test pilot Hans-Joachim Pancherz' logbook, the Ju 390V1 was brought to Prague immediately after it had been displayed at Insterburg, and while there took part in a number of test flights, which continued until March 1944, including tests of inflight refueling. 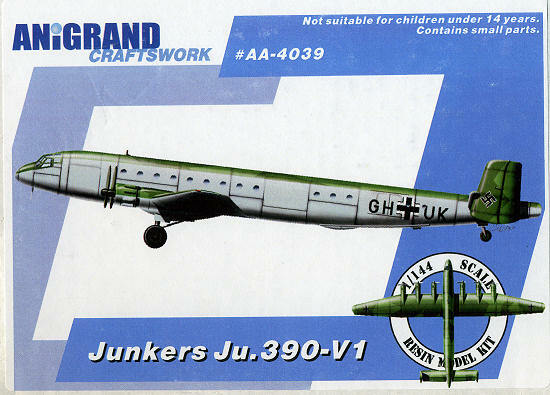 The Ju 390V1 was returned to Dessau in November 1944, where it was stripped of parts and finally destroyed in late April 1945 as the American Army approached. Typical of Anigrand kits, this one comes in a multi-compartmentalized poly bag with the clear bits in their own small ziplock bag. I am pleased to notice that this particular kit is nearly totally free of molding glitches, though I did find a few small air voids on the trailing edges of a control surface or two. The image you see to the left was pinched from the Anigrand web site as they do a much nicer job of laying things out. You'll notice that the Ju-390 wing is in upper and lower sections. The lower section goes nearly to the wing tip which helps to have a nice, sharp wing tip. The actual wing is pretty thick so having a razor sharp wing trailing edge is not a requirement with this plane. Since it has six engines, it has no fewer than 18 separate and rather small prop blades which will have to fit into six equally small spinners. Anigrand has realized that having a rather thick end of the prop to fit into larger holes in the spinner will make it easier for us to install these. Of course, the BMW engine had rather pronounced attachment areas so that is probably the reason for this. As it is a tail sitter, no need for weight in the nose. Also included are four smaller aircraft, three of which actually flew or even left the drawing board (at least I don't think they did. Perhaps the Payern, but I'm not realy sure.) The Horton flying wing actually made it into the air and it flew superbly from what I've read of the Horton Brothers and their inventions. The others are interesting to say the least and a nice little addition to the series. The clear bits are all thick and well done. Again, these have engraved frame work, making masking so much easier. The decals are well done and will allow one to do one of two schemes for the Ju-390. Besides the one on the box art, there is the initial roll-out scheme where the splinter scheme goes far down the side of the fuselage. While the upper colors are listed as RLM 71/83, I think that perhaps it should be RLM 72/73 if it was to be used in a maritime role. Decals are well done but one may want to find proper swastikas. Those split up ones rarely work as well as one would really want. However, due to their small size, one may not have any other option. 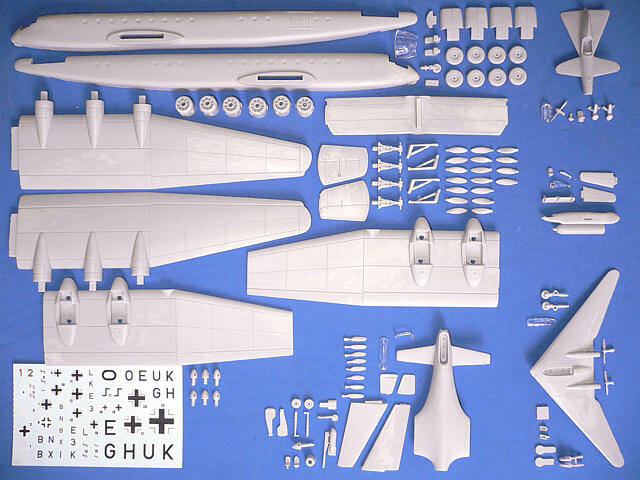 This is another fine 1/144 kit set from our friends at Anigrand. I'm so pleased to see these in a size that will actuallly fit on my display shelf. If you have a penchant for this scale and experience with resin kits, then I highly recommend these to you. Thanks to www.nostalgicplastic.com for the preview kit. Get yours today from the link and pay no shipping in the US or Canada.